When are you a “writer”? When you learn to pen your first letter? When you finish your first manuscript? When you win the Nobel Prize for Literature? Or the first time you attempt NaNoWriMo? Or the first time you put “writer” as your job description? Or the first time you bank a book royalty cheque? Or never? 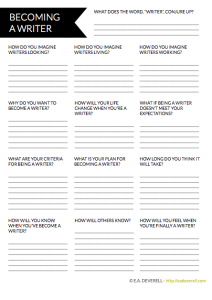 How will you become a writer and how will you know when you are one?